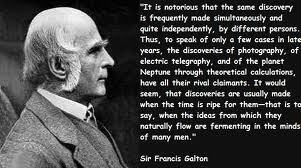 Francis Galton was born near Birmingham, England, in 1822. His impressive talents appeared early. At the age of three, he was already reading, and at four, he was studying Latin. His I.Q. at adulthood was estimated at 200. But as ayoung man of 22, a fresh graduate of Cambridge, Galton did not continue histraining as a physician. His wealthy father had died and left Galton a largeinheritance, so the young Galton was free to do whatever he fancied. For a time he chose to travel, exploring virtually unknown parts of Sudan, Syria, and southwest Africa. Upon his return, Galton published two books abouthis travels. He was even recognized by the Geographical Society and the RoyalSociety with various medals and honors. He was also knighted in 1909. Galton never held any academic or professional post. Instead, he did his experimenting at home or during his travels. His earliest researches had to do with meteorology. In his 1863 book Meteorgraphica, Galton presented themodern technique of weather-mapping and coined the term anticyclone to describe the high pressure systems that bring fair, calm weather. Because of thesestudies, Galton was instrumental in establishing the Meteorological Office and the National Physical Laboratory. In 1859, Charles Darwin, who was Galton's relative, published The Origin of Species. In that book, Darwin asserted that certain characteristics from two different individuals blend together to create variations in their offspring. Darwin also believed that these characteristics are "copied" within the parents' bodies and carried to the reproductive organs, where they wait topass on the traits to the offspring. Galton, seeing that this theory could be tested statistically, set out to support Darwin's "pangene" theory. It made sense to him that these "copied" characteristics were probably floating around in the bloodstream. So he chose totransfuse or switch the blood of a purebred silver-gray rabbit with a commonlop-eared rabbit. After breeding the silver-gray rabbits that had the blood of lop-eared rabbits, Galton found no difference in the rabbits' offspring. Silver-gray rabbits still produced silver-gray offspring. He thought this revealed the weakness of the inheritance aspect of Darwin's theory. Several years later, Galton came up with his own theory to explain inheritance: the theory of ancestral heredity. According to Galton's theory, each parent contributes half of the traits to the offspring, each grandparent one-fourth, and so on. With each generation, the traits become more diluted and the offspring begin exhibiting the average of race, not the average of the parents.Unfortunately, Galton's theory was still too similar to Darwin's "blending. "It did not survive the rediscovery and eventual acceptance of Gregor Mendel's work, which stressed particulate heredity--or the notion of traits being inherited individually rather than being blended. Nevertheless, Galton's theoryturns out to be mathematically sound in that one-half of any individual's genes come from each parent, one-fourth from each grandparent, and so forth. Galton pioneered studies of identical twins, whose differences can be attributed to environmental factors since they are genetically identical. He also studied talented families to determine how artistic, intellectual, or athleticskill might be inherited. Galton's heredity studies led him to believe that scientific breeding could be applied to human populations. Galton called thisscience eugenics. Eugenics entails "breeding in" desirable traits of the human population, such as talent and healthiness, and "breeding out" undesirable traits, such as stupidity and weakness. Galton suspected that gettingsuch a concept accepted would be difficult, but he devoted significant time and energy to ensure that the topic was not forgotten. He even donated a largeamount of his inheritance money to establish a Chair of Eugenics at University College in London. Later in his life, Galton became interested in fingerprinting. He thought itmight be a way to track differences in families, race, morals, and intellect.Although Galton never found any correlations to support this assumption, hedid establish fingerprinting as an easy and almost infallible means of humanidentification. The fingerprinting methods he developed are essentially the same methods used today.